But it can't be from Dolly Clackett. She gave me an Easter egg! : Excuse me, Meryl Streep could play Batman and be the right choice. She is perfection. Excuse me, Meryl Streep could play Batman and be the right choice. She is perfection. 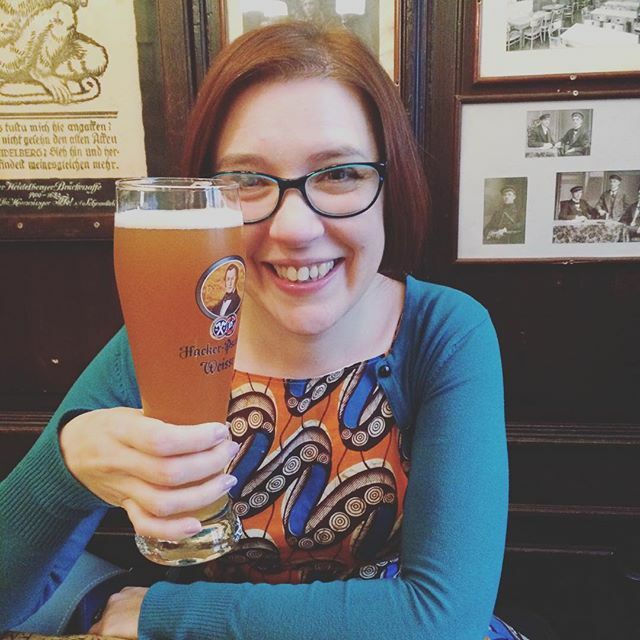 Here's me with a pint of weisse bier in Schnookeloch in Heidelberg. I have never been a beer drinker but I have been expanding my palate somewhat over the last few months, and while in Germany I managed to drink my first complete pint! This was not it - sadly, I didn't manage to commemorate that momentous occasion, which happened at the Ratskellar in Darmstadt - but, eh, you get the picture. It's just as well that I learned to appreciate beer because I was certainly in the place for it, although I did manage to also drink some gin while we were there. In fact, my holiday souvenirs took the form of three bottles of German gin. I did find some fabric shops and some yarn shops too, but I was much more in the mood for buying gin. 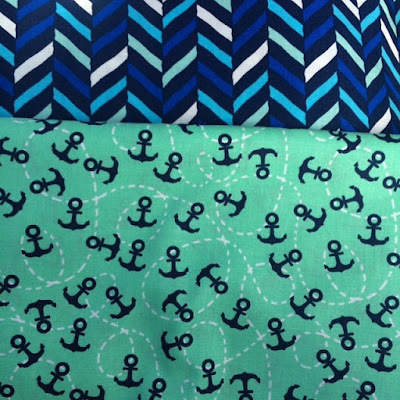 Anyway, I have a few trips to London coming up this month so I thought that would be a wiser place for fabric shopping. Ahhh. The lovely Kim bodice. I love the shape of this bodice but I am still working on getting the fit of it right. I'm short-waisted and have a short measurement between my shoulders and my bust, so I have found that the straps on the Kim bodice are very long on me. 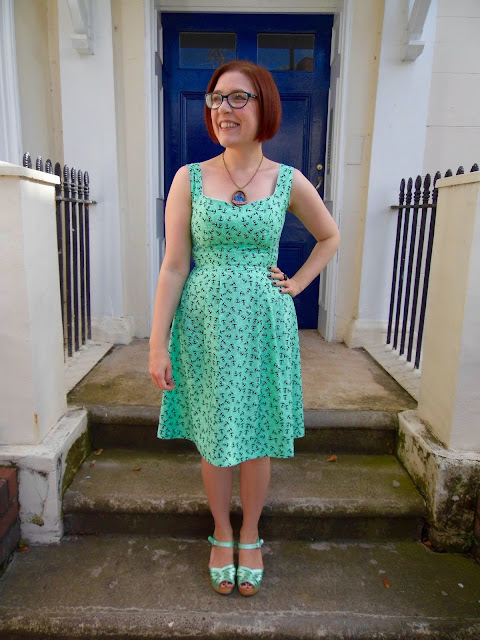 I have had to go back to a number of the iterations of this dress I have made in the last year and shorten the straps considerably, so on this dress I decided to compare the pattern piece against them and transfer this adjustment. I had a bit of a fright when I cut the fabric because the straps looked so short, but I think that they did work out to basically the correct length. I think they could stand to be a fraction longer - I wasn't as exact as I could have been, I guess - but the main thing is that they stay up! Here's a close-up of the bodice. 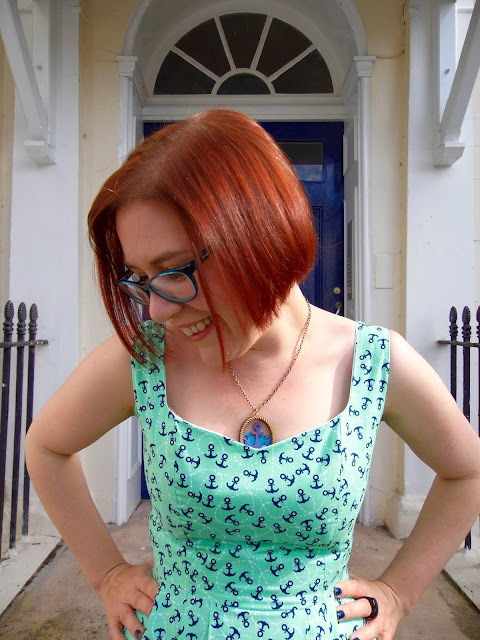 I didn't adjust the height of the neckline because I'm always a little bit paranoid about showing too much décolletage. It's because I'm so short - I'm always very conscious that anyone taller than me (most people, in fairness) can see right down my top! With that said, I was perhaps a little bit too conservative here and could stand to drop the neckline down a wee bit. I'm pretty pleased with this dress - I think it gets me one step closer to achieving the correct fit on the Kim bodice. I don't love it, but I must confess that this is partly because it doesn't look nearly as cute in these photographs as it did in real life! 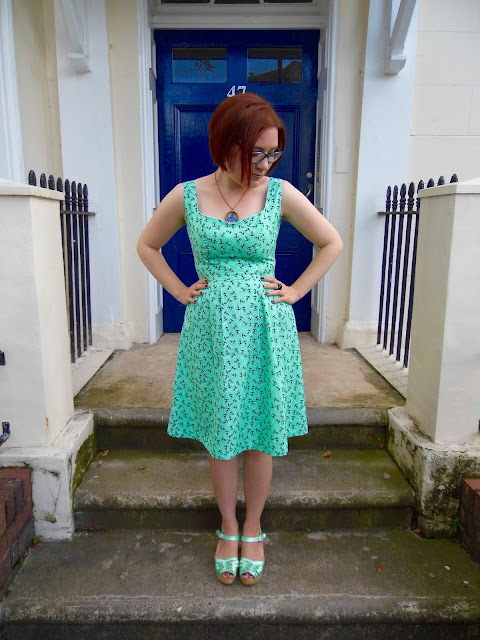 I've made better-fitting dresses, but making this satisfied a craving for sewing and so I'm very glad that I made it. I wore this on the Sunday after my birthday to go for a pub lunch and an unplanned pub crawl with some friends, and I did feel good in it. I didn't have a lot of time to take a variety of photos - we snapped these few on our way to the pub. You'll just have to believe me when I tell you it's cuter in real life! 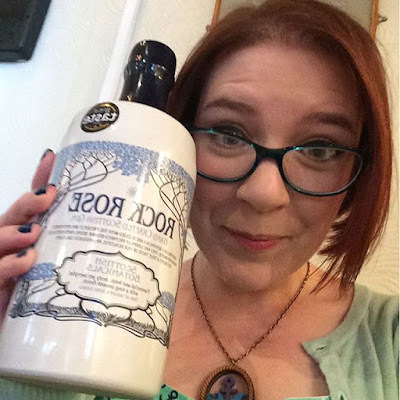 BIRTHDAY GIN! I have some very good friends. Okay, now. My German gin is becoming warm as I write this and I must go and wash the henna out of my hair. My life is all glamour. Auf Wiedersehen!